This entry was posted on Monday, May 13th, 2013 at 8:33 am and is filed under 2nd Sunday of Pascha - St Thomas Sunday, Audio homilies, Homilies. You can follow any responses to this entry through the RSS 2.0 feed. You can leave a response, or trackback from your own site. Every Divine Liturgy is a reenactment of this scene of the Lord inviting His beloved disciple to approach Him, touch His wounded Body and to cease disbelieving. 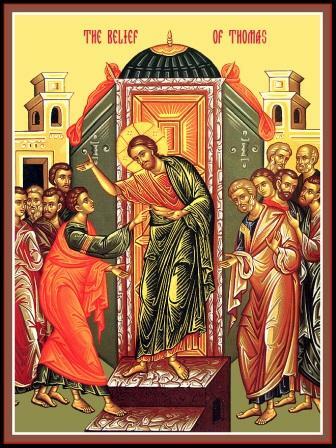 I, like Thomas, come with doubts, with unseeing eyes "…not discerning the Body and Blood" of my risen Savior, But coming, like Thomas, with the desire to believe, I respond to His invitation to "Come, taste and see that the Lord is good". The Lord is indeed good and He is indeed risen!